NTR Lunar Series 10 oz Bars. First Spouse 1/2 oz Gold Coin. Buffalo Gold PCGS Graded. Coins Remembered / Gift Ideas. “Birds of Prey” Gift Box. World Lunar Series Sets. Presidential Dollar Proof Set. State Quarters Complete Set. Perth Lunar Goat Gift Box. Sacagawea Dollar Proof Set. Morgan Dollar PCGS Graded. 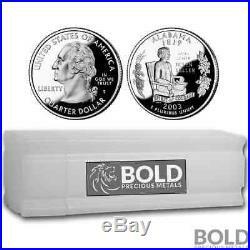 2003-S Silver Proof State Quarter Roll (40 Coins) – ALABAMA. 2003-S Silver Proof State Quarter? These 2003-S Silver Proof US State Quarter Alabama coins were pulled from sealed US Mint silver proof sets. Extreme care was taken not to touch or contaminate these silver proof quarters in any way. To preserve their condition, the coins were placed in a plastic tube holder and were extracted from the original slabs using cotton gloves. 2003-S Silver Proof US State Quarter Alabama. Pre-1965 composition of 90% Silver. Obverse: Features a redesign of the Washington quarter. Although John Flanagan’s original portrait of George Washington remains, the inscriptions and their placement are changed. Encircling the coin’s top rim is United States of America. ” At the bottom is “Quarter Dollar. ” To the left of the portrait is “Liberty, ” and to the right is “In God We Trust, ” and the “S mint mark. Reverse: Features a design, which commemorates a unique aspect of the individual state. Inscriptions include the state’s name encircling the top rim. Immediately below is the year the state ratified the US Constitution (or when admitted to the Union). Below the featured design are the year of release and E Pluribus Unum. Produced at San Francisco in Proof condition. These coins were only inspected to verify the year and count. They were not inspected to cull for cameos, deep cameos, variations, toned coins or mint errors. Expect to receive a mix of mostly gem proofs and a few toned/discolored/tarnished coins. The roll was comprised of a random inventory of 40 silver proof slabs. The older the coins, the more likely it is to receive toned/discolored or tarnished coins. The photo attached to this listing is a stock photo, but a representation as to what you will receive. The 50 State Quarters Program was introduced in 1999, under the legislative authority of Congress. The program was designed to honor each state in the order of their ratification of the US Constitution, or the year they were admitted into the Union. Each state would decide what unique aspect about their state they wished to feature on their new quarter. The process was usually headed by each state Governor’s office, and also include input from their citizens. The Program was scheduled to run for 10 years, releasing a new state quarter on approximately a ten-week cycle (5 per year). The first state quarter released was Delaware, proudly displaying the banner year of 1787, as the first state admitted to the Union. The 50 State Quarters Program was very favorably received by the public. People of all ages and from every state have been drawn into coin collecting, many for the first time. Although state pride was a real driving factor, offerings of 5-coin sets encouraged collectors to build complete sets. This is particularly true regarding the 90% Silver Proof coins. Enthusiastic collectors and investors continue to seek out Proof sets, individual coins, and full 40-coin rolls. The item “2003-S Silver Proof State Quarter Roll (40 Coins) ALABAMA” is in sale since Monday, September 11, 2017. This item is in the category “Coins & Paper Money\Coins\ US\Quarters\State Quarters (1999-2008)”. The seller is “boldpreciousmetals” and is located in Austin, Texas. This item can be shipped worldwide.